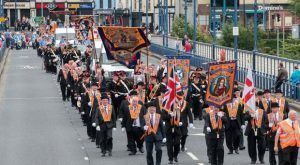 Last week the Grand Orange Lodge of Scotland at last got round to lifting the ban on its members entering Roman Catholic churches. Now, let’s get the terminology right. In Ireland, calling Roman Catholics ‘Roman Catholics’ rather than Irish Catholics or just Catholics is regarded as an insult by many who are both historically ignorant and keen to be offended. The late Sean O’Callaghan wrote in his memoir The Informer about the first time he saw Ian Paisley on television. The Orange Order declares itself to “stand for the true Catholic Faith and we deny any church the right to make exclusive claims thereto”. The 1937 constitution Taoiseach Eamon de Valera carefully crafted for what was The Irish Free State specifically said “the name of the State is Eire, or, in the English language, Ireland”. In many ways it was a relief when in 1948 the Irish Government announced it was a republic and declared that “the description of the State shall be the Republic of Ireland” – a description Prime Minister Clement Attlee told his Cabinet would bring an end to “the ‘inconveniences and indignities’ which we now experience as a result of our present policy of insisting on the title ‘Eire’ as against Dublin’s preference for ‘Ireland'”. I grew up in Dublin, where it was and still is felt that anyone English or unionist who calls the country Eire is being deliberately offensive, even though it’s on the stamp. As David Trimble pointed out in his Nobel Prize lecture, “the tradition from which I come… puts a great price on the precise use of words, and uses them with circumspection, so much so that our passion for precision is often confused with an indifference to idealism”. But back to the Scottish Grand Lodge, which has finally caught up with reality, for many of its rank-and-file attend their Roman Catholic friends’ and neighbours’ weddings and funerals. In 1998, after the Omagh bomb, First Minister Trimble, then the Orange Order’s most famous member, attended the funeral in Buncrana of three Roman Catholic children, where he was applauded. There were some mutterings among the bigots, but no action was taken against him. The Reverend Brian Kennaway, author of The Orange Order: A Tradition Betrayed, points out that in the 18th century the institution’s second grand secretary was married to a Roman Catholic and that the prohibition is directed at political opinions, not religion. 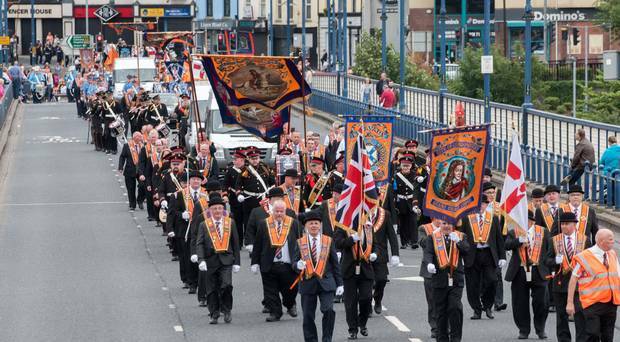 I have many friends in the Orange Order who are pro-Protestant, not anti-Catholic, but its greatest fans couldn’t claim it is swift to embrace change, though compared to its Irish equivalent, Scots are headstrong reformers.